I'm speeding across Southern California's Anza-Borrego desert with the speedometer pointing to the far side of 90 mph. As cliff walls and shrubs whizz past, my internal organs thanking me for going light on breakfast, I keep having the same thought: That's cool. 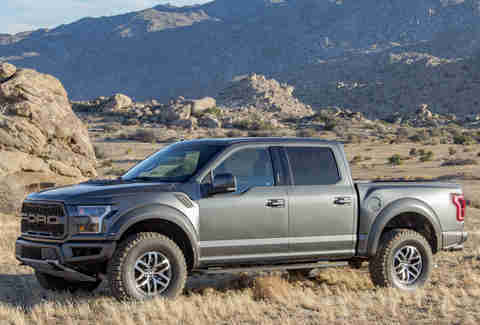 I'm not talking about the insane capabilities of the new-for-2017 second generation Ford F-150 Raptor... I'm talking about its air-conditioned seats. After 75 minutes of driving as fast as my sense of self-preservation would allow (I topped out at about 95 mph), I barely broke a sweat. That's truly the point of this truck: It's a 450-hp desert-destroying toy that doubles as a comfy, refined vehicle that's great for your daily commute. With a price ranging from just under $50,000 into the mid-60s after you're through ticking every option, it really is like having two trucks in one. 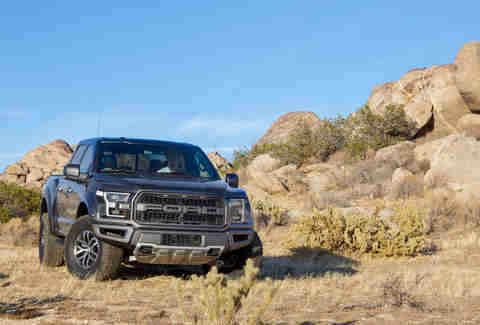 Ford fully expects that the overwhelming majority of the estimated 16-20,000 Raptor buyers will never take it off road -- much like the legions of BMW M3 buyers who avoid race tracks. And that's a damn shame. Rare is the vehicle that can absorb jagged rocks and blast across sand at almost 100 mph on the weekend, and still give you a nice, quiet ride to work Monday morning. Ford worked closely with Fox -- one of the premier offroad shock absorber companies in the world -- to heavily revamp the Raptor's suspension. The idea was to make the truck not only easy to drive fast, but so robust that anyone can drive it almost anywhere without breaking the truck in a giddy fit of over-exuberance. Thus, a host of unseen modifications stiffen and strengthen the chassis, and the engineers spent an eternity playing, excuse me, testing in the desert, fine-tuning up a bespoke traction control system that does fancy things like deliberately build up sand in front of your tires when you brake to provide more grip. What does that mean? As you can see in the video above, that means you can have a hell of good time and still drive yourself home when you're done. 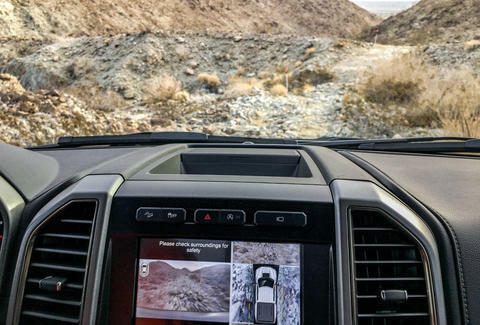 Generally, trucks prepared for serious off-road duty need to specialize in one area or another -- high-speed desert blasts or crawling up boulder-laden mountains -- but not both. While the Raptor was born in the desert, it acquits itself remarkably well when the terrain calls for extreme measures, thanks in part to unique bumpers that enable steeper incline approaches, and fancy tech options that let you focus all of your attention on the task at hand. The optional camera package is a must. It not only shows you what's coming up in front -- a necessary aid when you crest a steep mountainous peak and can't see anything but sky in front of you -- but it also shows you how close you are to giant boulders or cliff walls on either side. One beautiful side effect of that fancy suspension is that the truck is actually quite comfortable on the road. With a weight just north of 5,500lbs, it's hardly a sports car, but it does feel incredibly planted in a way most trucks simply don't. If you're planning on taking your family with you everywhere, the four door SuperCrew option (pictured above) is your best bet, but if it's just you, your dog, and a wide-open expanse, the SuperCab (with the backwards-opening half-doors) offers up a few performance benefits thanks to its shorter wheelbase. 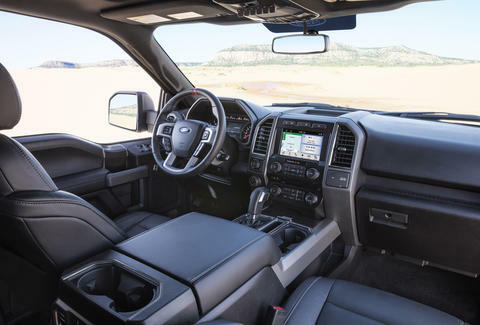 It's largely the same as a regular F-150 on the inside, but those Raptor-exclusive air-conditioned seats are comfortable for hours at a time, and do a fine job of holding you in your seat whether you're pulling into the mall parking lot or returning to Earth at 85mph. 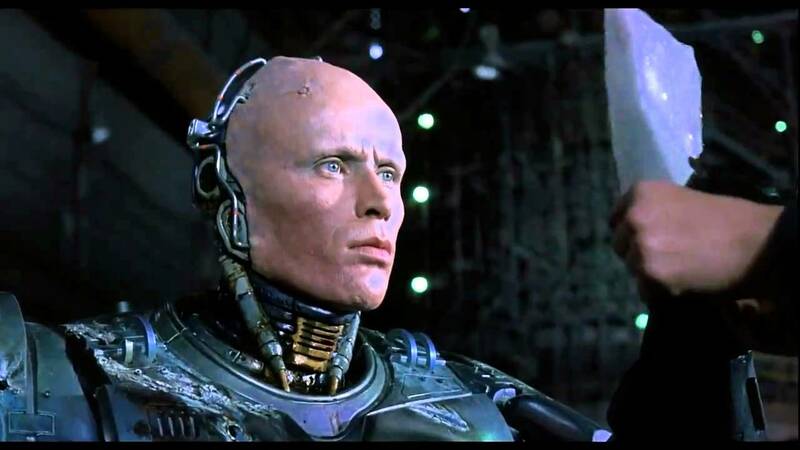 The Raptor is an F-150 in much the same way that Alex Murphy is a police officer in dystopian 1980s Detroit. The cab itself is the same, but virtually everything else is new and improved. It's 6in wider and has its very own 3.5L twin-turbocharged V6 (which benefits nicely from Ford's racing programs) that puts out 450hp and 510ft-lbs of torque. 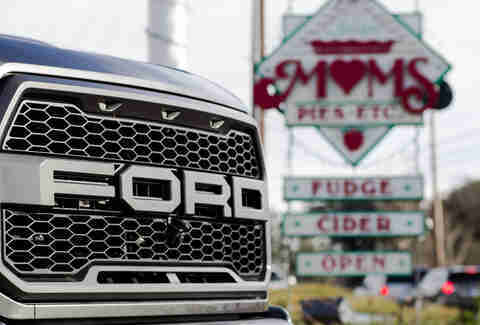 According to Ford, those three amber lights on the grille are actually required for vehicles as wide as the Raptor. 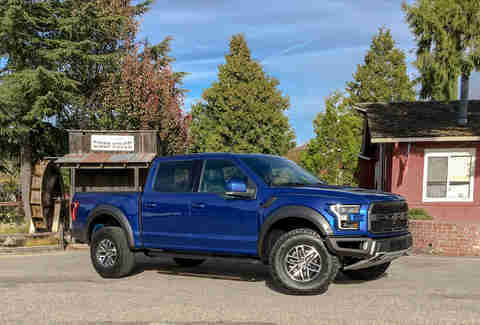 The vents on the fenders and hood legitimately aid in cooling, and even the tires, cool as they may look, are specifically designed for the Raptor's unique needs. 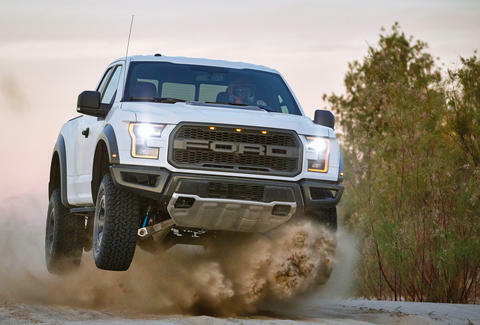 The new Raptor is powerful enough to tow an Airstream or a race car. It can race through the desert, scale mountains, and handle your kids' soccer carpool. Spending $50-60,000 on a vehicle that's built to scramble across the desert might sound like a lot, but it'll keep you as comfy and cool as can be expected from a truck, and when you consider that it's really two or three vehicles in one, that price ain't half bad. Aaron Miller is the Cars editor for Thrillist, and can be found on Twitter and Facebook. He wouldn't mind having a Raptor to tow his track car...not one bit.